Harvey Mossman April 19, 2015 Huzzah! Be honest, how many strictly tactical level ACW games could you name…apart from this one, that is? Actually, I rather suspect readers could name close to all of them – which is another way of saying that there have never been all that many. I recall Devil’s Den and Little Round Top, to which I could probably add Baton Rouge, MacPherson’s Ridge, Gettysburg: The Wheatfield, and Battles and Leaders. There may be a few others, but we have never been exactly deluged with tactical recreations of Civil War mischief. And therefore, that a new company wants to devote some serious attention to this sort of subject matter, and that the intention is to feature some lesser known and smaller Civil War battles as well as key portions of the big fights, is something to offer a welcome to. But there is another side to that particular argument – none of us have been especially vocal about missing this side of things in our ACW simulation fare, and the fact that not one of the above games (and some of them really rather good) have had gamers fighting for the last copy on the shelf, tends to imply that if you are going to commit to producing a series on this sort of stuff, it better be able to sell itself and look the part in every respect that matters. The battles covered in the first volume, are, at least for a Brit like me, a tad on the obscure side; but as I said above, there is nothing wrong with that in itself. 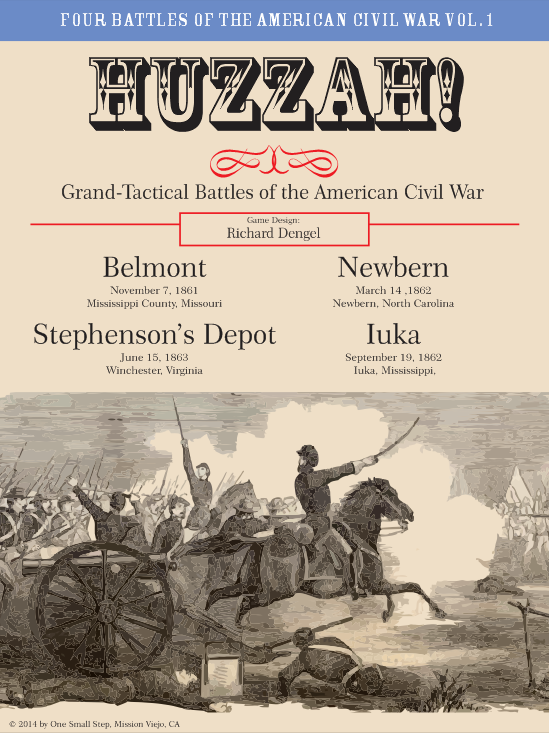 The battles you get are Belmont, Newbern, Stephenson’s Depot, and Iuka. The scale is regiments, represented by units each incorporating around three regimental companies; so, in turn, a regiment will have several units on the map. Artillery is shown by section, and there are also brigade, division and army leaders – the precise level and distribution of leadership depends on what battle you are playing. Component-wise, the game is pretty good for a new company seeking to get established. The box is sturdy, though, to be honest, the cover art, to my eye at least, is not that enticing. The rules and scenario books are both on very glossy paper, which, frankly, I do not like, but that sort of thing may be a matter of taste. The scenario book does have historical commentaries for all the battles covered, but again, it is not the most inviting of reads, being utterly bereft of any illustrations and essentially just a mass of text – and for someone like myself, being able to give my eyes a break does matter when there is set-up detail and other matter to be assimilated. The counters, on the other hand, are colourful, and I think, reasonably attractive. I would have preferred infantry figures to crossed muskets for the “battalion” pieces, but that is small beer. Two things you do have to be careful of when sorting out your units is that firstly, although many have been die cut ready to fall from the sheets should you so much as breathe on them, if your copy is anything like mine, a few units will not have been cut so near the mark, and there is a danger of tearing if you get too blasé about punching them out. The other thing to watch out for is if your units do come somewhat fallen off the sheets when you take delivery. The game documents themselves offer precious little help in sorting what unit goes with which battle, so you should avail yourself of the nifty organization sheets on BGG which clearly show the assignment of units by battle. The only other thing to say about the units is that they are, physically, a bit on the small side, especially given the generous size of individual hexes. Turning to the maps, they are attractive pieces of design, and have the double bonus of being of modest dimensions (no table hoggers here!) and having handy pieces of information, like the rather long turn sequence, printed around their margins. The only aspect of the components I really did not like were the main charts and tables sheets, which are on the same shiny paper as the rules, but being just single sheets, are rather on the flimsy side. So how do the rules read and how does it all play? In considering this, I have kept two of those former tactical games very much in mind, just to provide a measure – Devil’s Den and Battles and Leaders. I will be coming to some issues there a little later, but first, I just want to look at one or two points in the Huzzah! rules. The first pertains to ensuring (or in this case failing to ensure) that you do not toss out terms for your design without telling readers where to access their definitions. For example, early on in the rules there is reference to “O” hits, but no glossary, index, paragraph referral or elaboration meant I was left wondering what I was reading about – zero hits, or something else? As it was, O means Organization Hit, and frankly, all the rules needed to do at first mention was to display the thing thus (O)rganization plus a paragraph reference for the details. Overall, I felt the rules were a little hit and miss as to whether things got explained or not, and given one or two interesting decisions made by the designer, I would have liked some notes to help explain the thinking going on. These issues included cavalry not being able to dismount, and the long, multi-segmented structure of the turn sequence. However, what I was more bothered about were two pieces of “gamey” structure in the system. The first pertains to issues within the turn sequence, which, unrestrained by the rule in question, would allow what you might reasonably call an engaged unit to hop out of receiving fire, and then hop back again – and all because of what follows what in the course of a turn. To prevent this, the game forbids a unit that moves out of a fire zone in one part of a turn to then hop back into it a little later. This is all well and good in one respect, as none of us likes gamey practices; but be that as it may, I do not see how things are made better by having a gamey rule dealing with a gamey practice. I prefer to think of rules as the shapers of the real world turned into our cardboard and paper world of conflict. For me, it is hard to see a “no hop” rule as anything other than a contrivance that has nothing to do with a battle environment. I must admit I have been left wondering why the designer did not simply hit a withdrawing unit with an immediate fire attack penalty rather than go with a rule like this? There may be a reason I cannot see, but on the surface, this looks odd and clumsy. As I looked through the rulebook, I felt increasingly desperate to find a real sense of colour and occasion as to how things were being presented. Late in the rules, there is provision for bayonet charges (referred to as a potent psychological weapon), but the mechanisms of the game do not really have you either seeing it thus in your mind or played out with such effect on your map. There is surely a serious commitment about fixing bayonets in the mind of any combatant, but as it is, the game works its processes and modifier shifts in ways I cannot always connect to what I am supposed to be playing out. Men hastily run from leveled bayonets, (bayonet wounds were rare as the receiving side almost invariably skedaddled) but that does not really manifest itself in this aspect of the design. Elsewhere, to be honest, when it comes to the rules for movement, combat, and the effects of leaders, there is nothing here that will take a gamer of any real experience by surprise or come across as truly innovative. Leaders do the modifier and rally stuff, infantry shoots and shoves, artillery fires, and it is all a bit on the dry side. 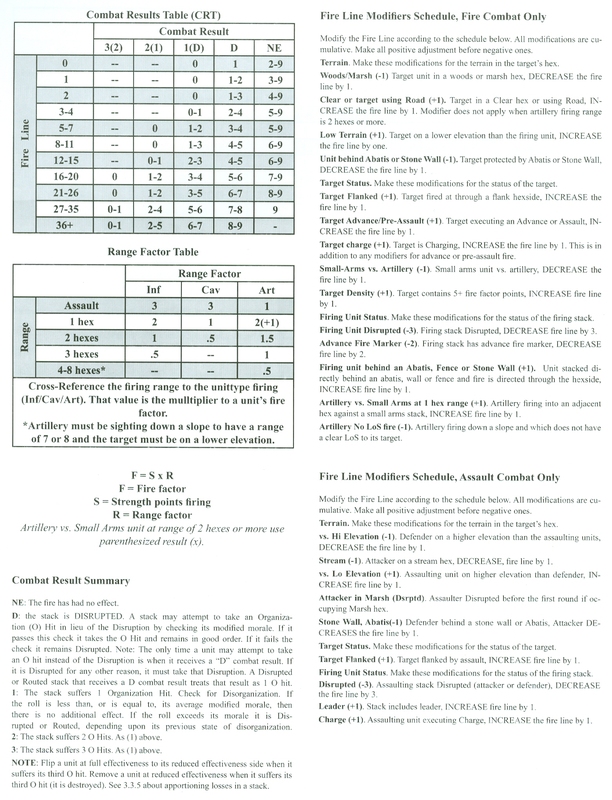 One nice effect worth mentioning, however, is the straggler rule, which reminds me in a way of those in the old Battleline/Avalon Hill Fury In The West. Basically, if you start sending the boys a-whoopin’ and a-yellin’ and whatnot in the woods, the whoopin’ is rather likely to be replaced by the wanderin’ off. This is a good rule, and I just wish the game had a bit more of its like. Indeed, more than anything, it is the lack of narrative colour throughout the entire design that disappoints me. Both Battles and Leaders and Devil’s Den are more than thirty years old, and yet, I really do not see this design as marking any sort of moving on to offer a new state of the art for the bygone State of the (Dis)Union. In fact, I could argue that those older games did rather more than Huzzah! – Devil’s Den had individual regimental commanders of varying quality leading the boys on; fences came down; snipers went and hid in the rocks, and it all felt rather interesting; Battles and Leaders, on the other hand, I particularly recall for its event table, with all kinds of chaos, disaster, humour and whatever likely to occur as the fighting got seriously underway. Incidentally, there is one aspect of Huzzah! that may take inspiration from Battles and Leaders. Both games, if memory serves in the case of the older title, employ a form of hit registration that is not so much about obvious casualties, but of a unit losing an ability to function. These are the Organization Hits of Huzzah! – what they were called in Battles and Leaders I cannot recall, but they were denoted by placing a small circular red token on the affected unit, and were again more about a unit losing combat effectiveness than representing lots of dead soldiers. With some frustration, I cannot recall whether Battles and Leaders units could shed such hits, but they certainly can in Huzzah! via a regroup action. Getting units to regroup is probably essential in order to keep an effective force in the field, and to my mind, is one of those game functions that virtually screams out “Add Some Colour!” Leaders can make a difference to your regroup chances, but as all leaders make the same difference, and as nothing else is really added to the mix, what you have here is just another bit of process. When I think of Civil War battles as they might be right there on the firing line, (and I am talking more of game drama, not war’s appalling tragedy and terror) I will recall the paintings of Don Troiani or Mort Kunstler, and yes, the Little Round Top battle scene from Gettysburg as well, with a colonel or two pacing the line calling out “Pour it on boys, keep it up, that’s the style!” I just wish there was a bit more style in Huzzah! What I think the series is crying out for is a set of semi generic event cards, with a draw at the beginning of a turn, or triggered by some on-map occurrence. This need not muck the whole system up – you just ensure that what happens suits the system, but at the same time gives it some battle tension, humour, uncertainty, and thus invites us into the system in a way I cannot experience as things are. Beyond that I feel it was not a good idea to eschew regimental leaders. If you are down to this intimate scale of battle representation, you surely want that sense of the colonel leading his boys – or hiding in some bushes. I would not claim that Devil’s Den was the last word in how to do things, but the regimental leaders there were so integral to the game, added big doses of colour, and could hardly be said to have cluttered things up. In short, as ever, opinions will vary as to whether this design is the glass half empty or half full. But I am very conscious that this has been a genuine effort to do something rarely done in our hobby, and as such, I really hope the series can evolve in feasible ways into something a little more colourful and attractive than it is for me right now. We like to hear from you. Please feel free to leave your comments below. Paul has been involved in the hobby since the early 1970s. Of largely Belgian ancestry on his father’s side, and English (Yorkshire) on his mother’s, after finishing his education he worked in tourism and student services, and also spent some time in the former West Germany. He met his wife Boo in 1990, and they married a couple of years later. Paul hails from a long line of former servicemen – one grandfather was a sergeant in the BEF of 1914, whilst two of his great grandfathers were killed serving with the Royal Navy. His own father, who was born in Britain, served with the army in Malaya in the early 1950s. Posted in Huzzah! and tagged Belmont, Civil war, Confederate, Conferderacy, Iuka, Newbern, Stephenson's Depot, Union, War for the Union. Bookmark the permalink. 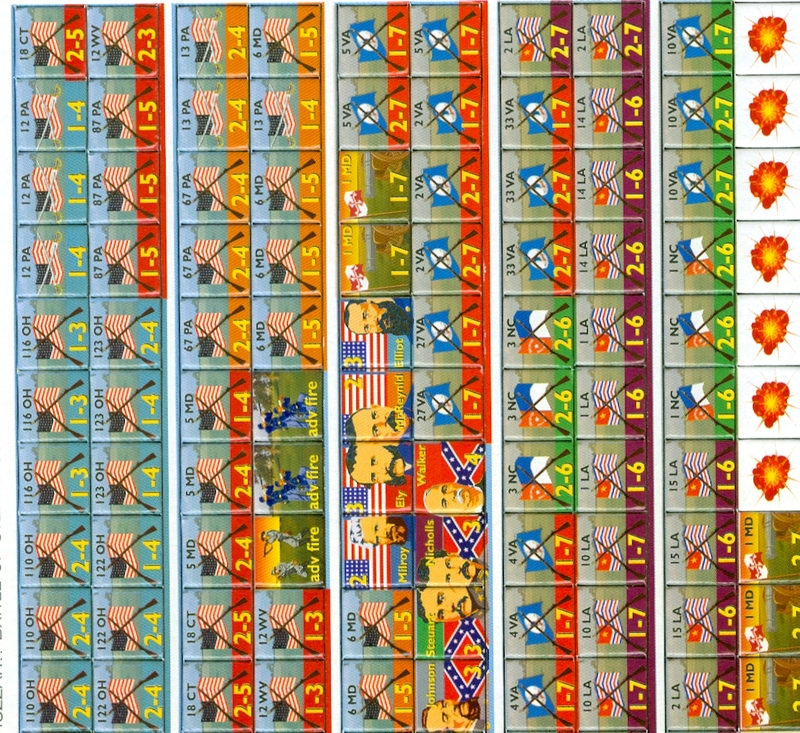 You wrote a review of Huzzah and gave a synopsis of other tactical level ACW wargames but failed to mention the game designers preceding tactical design, Rebel Yell, of which Huzzah is related, or any of his other preceding tactical level games. Part of doing a review isn’t just playing the game or saying you’ve been in the hobby since 1970. It involves doing some research and getting a broader understanding for what you are reviewing. 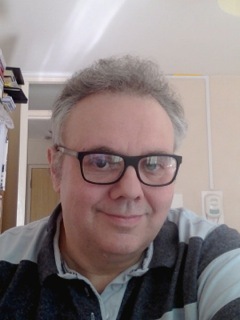 Richard Dengel has been involved in ACW tactical wargaming for at least 20 years and has designed and published numerous games in that milieu, including Rebel Yell which while considered imperfect and lacking in some areas is viewed by many as an outstanding experiment in true tactical level period gaming. Huzzah was a direct response to the concerns and issues around Rebel Yell, something that is critical to understand when reviewing the current game and something you missed entirely. I’m guessing your opening hook for this review in which you imagine gamers struggling to recall tactical level ACW games wasn’t based so much on gamers in general as it was on you as your lack of knowledge on this genre shows. As the designer of Huzzah! and her sister game Rebel Yell, I would be amiss if I did not respond directly to this article. Regarding OSS, this is hardly a new game company as the article states. In fact, it has been around since 1996 with more than two dozen games in its stable. It was founded in 1994 as Game Publication Group (GPG). Its flagship game, published that year, was my game Rebel Yell. An ambitious attempt to simulate the ACW at the company level, it was, admittedly, an interesting failure. If you look hard enough you can probably still find it on-line. While it garnered its share of criticism it was also reasonably well-received by hard-core ACW gamers and it still retains a loyal base. It was reviewed in Fire & Movement, Paper Wars, Berg’s Review of Games, as well as other publications long-since gone. As a published designer, I, like OSS, have been around for more than 20 years. That the author missed these facts entirely casts suspicions on many of his following conclusions, at least for me. Likewise there was no insight into combat other than to say that the tables were printed on “glossy paper.” There was no attempt to evaluate the interplay between movement and fire, which, to anyone who has actually played the game, is the heart of this system. Again, you may or may not like that interplay, but there should be some attempt to say why. 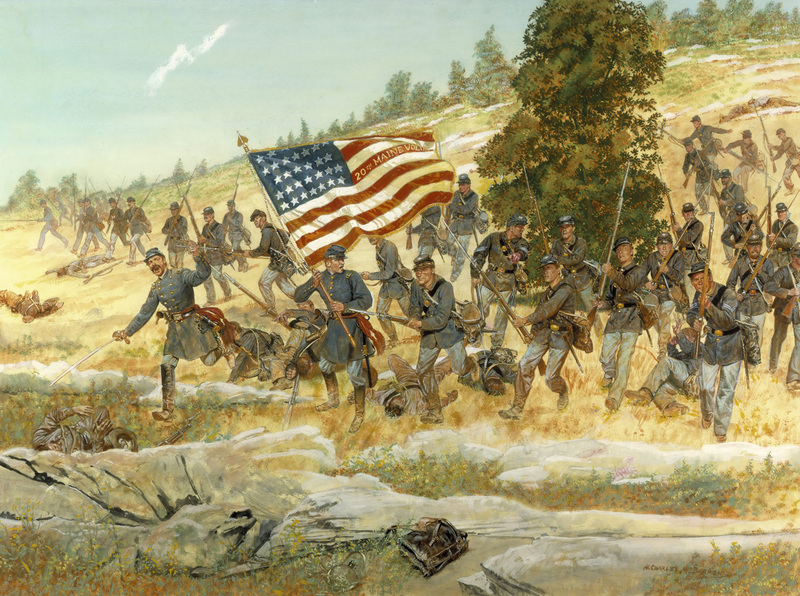 Similarly, the only thing said about bayonet charges was that in actual ACW combat there were few bayonet wounds. Ok, got it. And how does this dynamic play-out in the game? Good? Bad? Ho-hum? The one positive thing said in the article, about Stragglers, again had no relationship to actual game-play. What is the real effect of the rule in an actual game? On that the article is mute. The “gaminess” insight was fair, to a point. I’d just note that the rule, not my favorite, is there precisely to stop players from gaming the system. In actual play, the rule, as labored as it is, is hardly noticed. I think the criticism expressed in the article can best be summed in 6 words — “Not enough pictures, too many words.” It left me wondering if the author even attempted to play the game. One other thing I would like to add, and of course I referred to this in my article, is that the absence of any designer notes did make it difficult to know what the designer was aiming for by any particular provision. – which then makes it all the more difficult to comment on. As for the skirmisher rules, which neither of my critics referred to in their comments, was I being too negative in comments there also? I do not think so. I saw it as an issue with the game, so I commented on it. Reviews of games come in all shapes and sizes – five minute snippets on YouTube, a couple of paragraphs on BGG etc – or sometimes, but by no means always, they are a bit longer. I doubt if any review of anything, however, has covered the absolute entirety of a design – the aim is to be able to see the wood, despite the trees…at least I hope so. My look at Huzzah! ran to over two thousand words – so was hardly a brief in and out. I am not writing a set of rules, and beyond those already sold on the system, people do want something that is a comfortable and enjoyable read. I approached the game from terms of reference I felt a reasonably broad range of readers could relate to, and which would acquaint readers with the salient issues I had with the system. People naturally want to know about the physical quality, want to know if the rules seem clear and attractively presented, and how the system feels to a player like myself. I was hardly caustic in anything I said, and frankly, through opinions shared with me, I am not the only person who found the design wanting in colour. This matters to me; perhaps it will not matter to someone else, and that will be entirely the product of their taste and their own opinion. And I am sorry, but having a gamey mechanism to stop hokey-cokey manoeuvres around fire zones is a telling enough look at the turn sequence, and says a lot about what I did not like. I feel my review offered plenty of encouragement around the project, and was far less negative than the sort of terms which YouTube reviewers employ. As for research, I was looking at this game, as a product in itself – as many people will be. I have not got access to every last thing on the subject, and fail to see where that would help readers decide whether to go for this game or not. It is what it is in the box – and I was not overly impressed. But that is just my opinion. I have to say that I found the review reasonably informative and not particularly negative. If this was a subject matter of interest, it would certainly not stop me from purchasing it. I neglected to thank you, Paul, for the review. Your critique is well-taken and the deficiencies (skirmishers, etc.) will be rectified as this project evolves to its next iteration. Friends of the game have already provided solid recommendations for version 3.0 of the rules. Players may feel free to contact me at the OSS/Huzzah forums on Consimworld or BoardGameGeek (just do a search on Huzzah). I answer any and all queries, technical or otherwise, with on-going support my prime objective. Perhaps in a year or two, who knows, we’ll have occasion to cross again. First, apologies for taking a while to reply. I am a carer to my wife, as well as being somewhat disabled myself, and we have both been on a respite break. I just want to wish Richard and those involved in this ongoing project every success, and look forward to seeing the next game in the series.